When First Petro took the control of Russia in 18 th century, the changes started. First Petro was wanting to get the control of the hot waters (aegian and mediterrennan). For this he was wanting to take the control of the straits, in order to weaken the Ottomans. Provoking and Making an alliance with Greeks against the Ottomans was one of his plans. He was knowing how hard it will be to reach Istanbul by passing the Black Sea. Because of this he made a plan that Ottoman would never thaught. His warships left Petersburg and reached Adriatic sea then Gibraltar strait and Mediterennan. 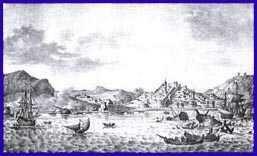 In 5th of July 1770 they reached to Cesme. Cesme was a strategically important port in the protection of the straits and in sending soldiers to war. When Russians reached the Aegean sea, The Ottoman Navy was all anchored in Cesme Harbour. On the most outer part, there is the leader of the Ottoman Navy, Burc-u Zafer ship with her 90 guns and the best sailors of the Ottoman Navy. In the leadership of Admiral Spridov, Evstafii and another war ship started moving to BUrc-u Zafer, in order to destroy her and the Ottoman Navy. But Hasan Pasa from Cezayir noticed them and turned the guns to Yvestafy and started waiting. When they reached close enough, he ordered to fire. Yvestafy lost control and hit to Burc-u Zafer. Admiral Spridov noticed the condition will be bad and he ordered to sink the ship. But he noticed that one hole wouldn't sink the ship so he fired the armory and left the ship. Evstafii sunked with a huge explosion. She taken 900 Russian sailor, a few Ottoman sailors and 500.000 Catherine gold with her to the depths. Then Russian Navy noticed that the Ottoman navy was anchored too close to each other. So they sent three suicide ships to the Ottoman Navy but only one of them reached to the navy. 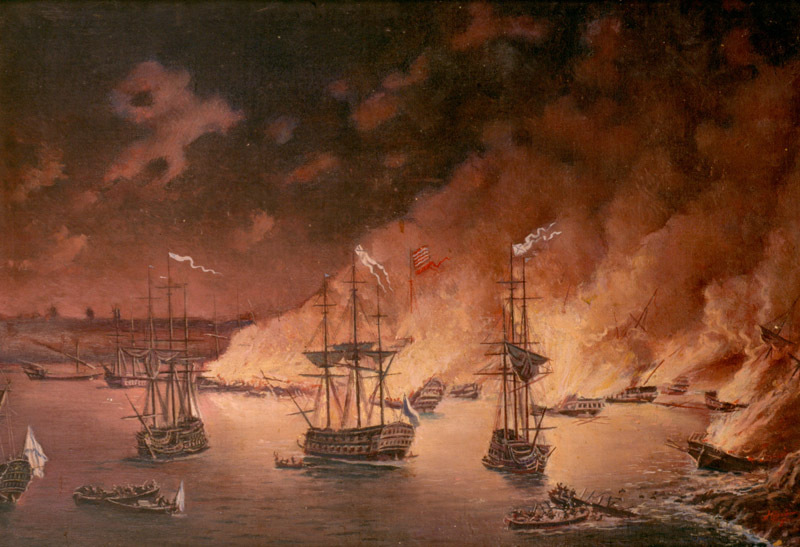 The fire started with the explosion of this ship spreaded one bye one to the Ottoman navy ships leaving only one ship undamaged. The researches of this wreck continue from 1995. The artifacts found from this wreck are being shown in the Bodrum Museum. This projest continues under the leadership of the principle of Cesme Museum and archeologist Yasar Yildiz. Also artifacts from Evstafii are being shown in Cesme Museum. There are Catherine golds that would be used in war against Ottomans, The cavalries' belongings, a key with the Czardom's symbol on it and sceletons that shows the density of war, between the artifacts salvaged from the wreck. On one side of Catherina golds, There is a portrait of Catherina and on the other side there is picture of capturing of Ayasofia Museum. Under this picture there is an inscription saying "If you believe, you will be succesfull". After this war Catherina The Great constructed four places for this victory. She is the most important underwater treasure of Cesme. The remains of this ship are located between Sakýzada Island and Damlasuyu, 400 meters from shore and at a depth of 42-51 meters under the surface.